Members of the GlobalSoilMap scientific team met in Ottawa in November 2015 to discuss initiatives to continue and to promote work by countries toward the goal of producing a global gridded soil attributes map at 100m resolution. The project has been on-going since 2008 with most progress being made by Australia, EU countries and the US. Canada is a very large country with incomplete coverage of the soil data required to meet the GlobalSoilMap objectives and specifications. Immediately following the GlobalSoilMap meeting, and in response to a need to have consistent soil information available for the boreal forest region of Canada, David Paré of the Canadian Forest Service in Quebec City began plans to host a workshop on digital soil mapping. That workshop was held March 15-16 and was well attended by some 26 federal, provincial and university soil scientists. At the conclusion of that workshop, the attendees agreed to move toward the development of a national Digital Soil Mapping (DSM) working group with the aim to facilitate the development and application of DSM techniques in Canada. 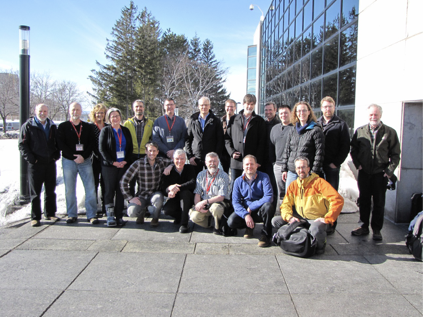 Participants of the digital soil mapping workshop hosted by the Laurentian Forest Research Centre in Quebec City in March 2016. Representatives of federal, provincial and university organizations were present. At the 2016 Canadian Society of Soil Science (CSSS) annual meeting in Kamloops, British Columbia, the Pedology sub-committee of the CSSS endorsed the idea of forming a national digital soil mapping working group. The goal of the group is to encourage and facilitate digital soil mapping in Canada. To this end, we are extending an invitation to those who are currently conducting work in digital (predictive) soil mapping at any scale (field to regional) to join the working group. A key objective is the creation of a digital soil map for all of Canada that meets the GlobalSoilMap standards. There are many aspects to doing this including methods development and testing, preparation and sharing of co-variate and pedon information, and subsequent validation. Our intent is to make the working group open to all those with an interest in this area of soil science and to capture a wide range of work from all regions and environments in Canada. If you are interested in joining the working group, please contact Brandon Heung.